This South Korean gut-buster went down a storm at the 2017 Cannes Film Festival, where it had its world premiere and received a four-minute standing ovation. Luckily, much of the film’s critical acclaim is actually warranted. Director Jung Byung-gil sets his paranoid revenge fable in a rain-soaked, leather-clad, neon night-vision of Seoul; it’s like looking at the city through the pages of a dystopian comic book. His frantic, inventive action sequences are the film’s masterstroke. He leaps from John Woo-style gun fu to knife-weilding blood splatter like something out of The Raid, via extraordinary first-person fight sequences which jump straight out of a video game. These sequences are exhausting, disorientating and highly accomplished; a remarkable combination of choreography, special effects and editing. On top of all that, the film contains a strong central performance from Kim ok-bin, whose career has moved from beauty pageants to TV star and now a vengeful, Lady Snowblood-type assassin. She balances cold-blooded menace with acute sensitivity in a bravado performance. 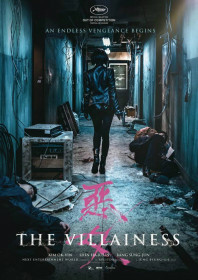 As corrupted killer Sook-hee, she displays her emotional side via a tender relationship with an infant daughter and a developing romance with her new neighbour. Her explosive side is shown in breathtaking set-pieces involving machete battles on speeding motorbikes and a riotous end sequence in which she rides on the hood of a moving car before launching herself into an axe-wielding attack. Its only the film’s non-linear narrative which lacks cohesion, and the ulterior motives of many of the characters go from intrigue to confusion. Most of the story’s ambiguity is somewhat justified in an attempt to make our sympathies align more closely with Sook-hee, who is shown to have witnessed her father’s brutal murder as a child and is brought up in a world of violence and deceit. She becomes a vengeful killer before being captured and indoctrinated into the ‘agency’; an intriguing, minimalist correction facility with lab space, mad doctors and Christian iconography, where she is trained as part of an all-female fight squad to carry out assignments by their androgynous leader and her dweeby, male subordinates. The agency appears to be an off-radar, non-governmental splinter cell who may or may not be the real baddies in this story. They keep a constant watch over Sook-hee’s activities through double-agents and hidden cameras, which Jung Byung-gil uses to add an uneasy voyeuristic tone to the film, but the agency’s true motives are never fully explained. The story’s constituent parts buckle slightly under closer scrutiny, but its still an inventive, action-packed thrill-ride.